Oxpeckers | Will the Maputo ivory burn make any difference? Will the Maputo ivory burn make any difference? 10 Jul Will the Maputo ivory burn make any difference? Millions of dollars’ worth of ivory is being trafficked out of northern Mozambique, where elephant poaching statistics surpass even those announced by environmental organisations. Aided by official complicity, Mozambican, Tanzanian and Somali poachers slaughter the elephants with high-calibre weapons and smuggle the ivory through Mozambican ports, airports and borders, destined mainly for China and Vietnam. In 2014 the Wildlife Conservation Society warned that between 1,500 and 1,800 elephants are being slaughtered annually in Mozambique, saying that “elephant poaching has been industrialised” along the northern borders of the country. According to Cornelio Miguel, administrator of the Niassa National Reserve, an average of five elephants is being slaughtered each day. As a result, the population of elephants in Niassa reduced dramatically from 20,374 to less than 13,000 between 2009 and 2013. In the Quirimbas National Park in Cabo Delgado province, administrator Baldeu Chande estimates the elephant population had crashed from 2,000 in 2008 to about 400 in January 2015. 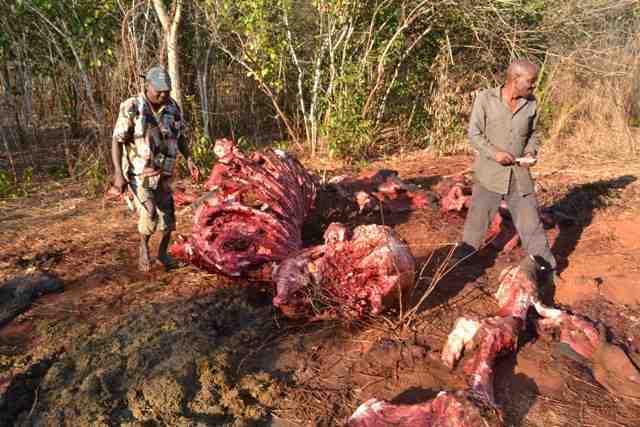 Recently 114 elephant carcasses were discovered at Taratibu inside the park. I witnessed this reality on the ground in Niassa National Reserve in October 2014, driving almost 400 kilometers each day, going for hours without a glimpse of tarmac, sometimes with the fear of becoming lunch or dinner for wildlife, or the target of poachers or corrupt authorities. I also covered Quirimbas National Park in Cabo Delgado province, where the scenario was not much different. Speaking to rangers in both parks, it was clear they felt undermined by a legal system which enables poachers to be released and does not punish the criminal syndicates backed by Mozambican officials involved in the illicit trade. At the Mecula Police Station in Niassa, I spoke to elephant poaching suspects António Bernardo and Paulo Nhenge. Bernardo, also linked to rhino horn smuggling from South Africa’s Kruger National Park, had been arrested by Niassa rangers in possession of AK-47 rifles. Nhenge was arrested in possession of firearms, but claimed he only killed elephants on orders from a local military commander. The two suspects appeared serene, as if they were biding their time while waiting for the day of their release. This did not take long, because a week later they “escaped” while being transferred from the police holding cells to prison. Bernardo was recaptured on January 23 2015. He told people in Niassa National Reserve that he had paid a bribe of $16,129 to the Mecula prosecutor and the police chief of operations to release him and Nhenge who is still on running. Before their escape, I asked the Mecula police commander, Alberto Manuel Imede, about the alleged involvement of the local civil police, border patrol, and legal and judicial systems in supporting poaching syndicates and the illicit trade. He avoided answering directly, and instead ran into a police cell where poaching suspects were locked up, to show the commitment of his department. “They are not released, we have no corruption,” he said, pointing out several poachers being detained in Mecula police station who were due to be transferred to the court in nearby Marupa. Later Imede laid the blame for the escape of Bernardo and Nhenge on the local prosecuting authority. Tiago would not say if the police chief of operation had received the bribe money, and said he was surprised to hear that Benardo mentioned his own name in connection with the $16,129 bribe. In Cabo Delgado province, home to the Quirimbas National Park, there was a similar situation of high-ranking officials being involved and the legal system facilitating the release of people involved in poaching syndicates with the “silence of the Mozambican general attorney”. No investigation was conducted into the role played by prominent figures in the ruling Frelimo government, such as the chief secretary of Muaja village, Horaio Radio. 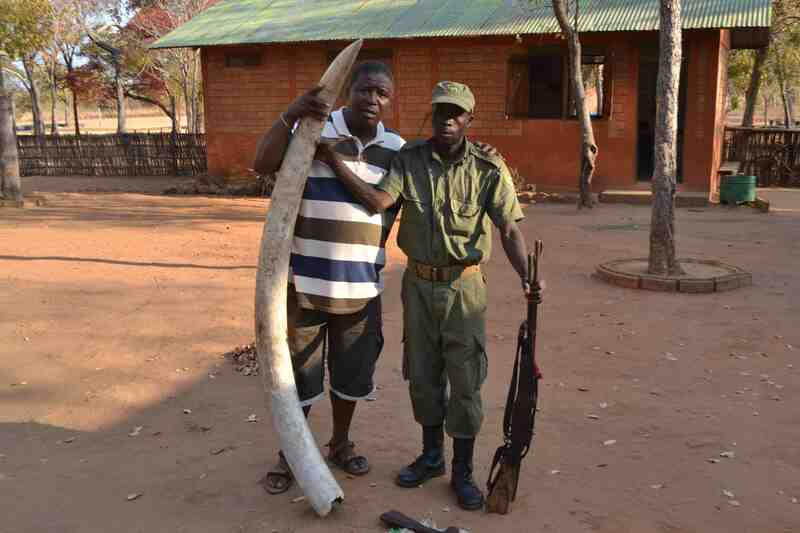 Dora Manuel Manjate, the former Cabo Delgado provincial police commander, was implicated in facilitating the smuggling of ivory, illegal timber and rubies by Chinese company Mofid. 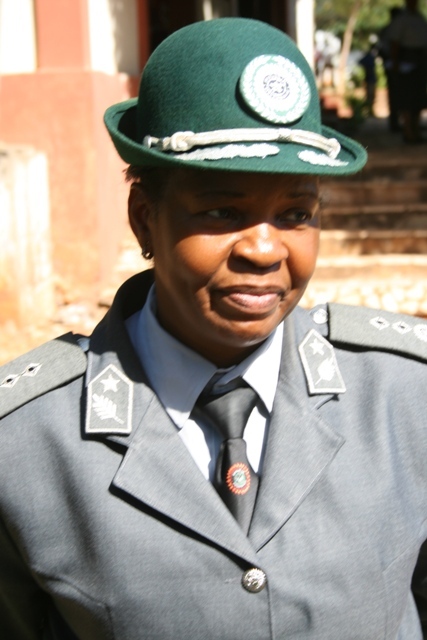 Instead, she was transferred, after receiving a bonus from the government, and today she is the Inhambane province police commander. A 15-page document put together by Cabo Delgado police officials complained about Manjate’s behaviour, with allegations against her ranging from tribalism to nepotism and defending the police commander of the Mozambican Intervention Force (FIR) in Montepuez district, Jaime Biza, against accusations of his involvement in the illegal ruby business. Biza was also found to be driving a car involved in an accident that caused the deaths of two civilians. This case was archived by Manjete in order to protect Biza, according to the document. The document was sent in September 2014 to the Cabo Delgado governor at the time, Jorge Khalau, general police commander Abdul Razak, and to the Mozambican interior minister and the state security intelligence service director. These leaders remained silent, choosing not to respond to questions from the media, and no investigation was held into the allegations by either the Mozambican general attorney or at police level. Mozambique has signed several regional and international conventions, agreements and protocols prohibiting illegal timber and wildlife trafficking. In addition, the country’s penal code provides for imprisonment of eight to 12 years for the illegal possession of firearms or ammunition. These laws exist on paper and yet the authorities are still releasing people involved in poaching activities, based on bribes. Some of the instances are exposed in reports of the Mozambican criminal investigation police, as well in reports from provincial attorneys and courts. All this happens before the eyes of the tribunals and prosecuting attorneys who, instead of keeping the offenders in jail, allows them to return to their poaching activities – often even more organised than before. In Muaja village in Ancuabe district, for instance, some of the poachers involved in a massive poaching operation had been detained and released by the legal and judiciary system on more than three occasions. As a result the poachers were able to partake in a death squad for elephants inside Quirimbas National Park, about three kilometres from where we were reporting. Five elephants were slaughtered by the poachers in less than 24 hours. Villagers alerted us to the slaughter, and told us the poachers were former “freedom fighters” from a village called Mbongo where apparently there are many illegal firearms. It was about 19h00 when we left the place where we were based on a motorbike to follow community members rushing by foot and bicycle, armed with machetes, small knives, anything that could cut a piece of meat. In the bush where the poached elephants lay, people were chatting, screaming, laughing while they divided up the fresh meat. In less than a minute the elephant bull was gone. On the ground only skeletons remained. Before poachers used to go poaching in a group of four to six people, but today they are composed of 12 to 15 people. In early December 2014, 12 “guerrilla” poachers armed with AK-47s and wearing military uniform held an elephant raid over the course of two weeks, starting from tobacco plantations along the Montepuez river bank, even terrorising community members in Muaja village. One of the poachers was Mussa Namparavara, who had recently been arrested and detained in police cells before being released. The Ancuabe police and state security intelligence service pursued the poachers, but they managed to escape onto the tobacco farms. 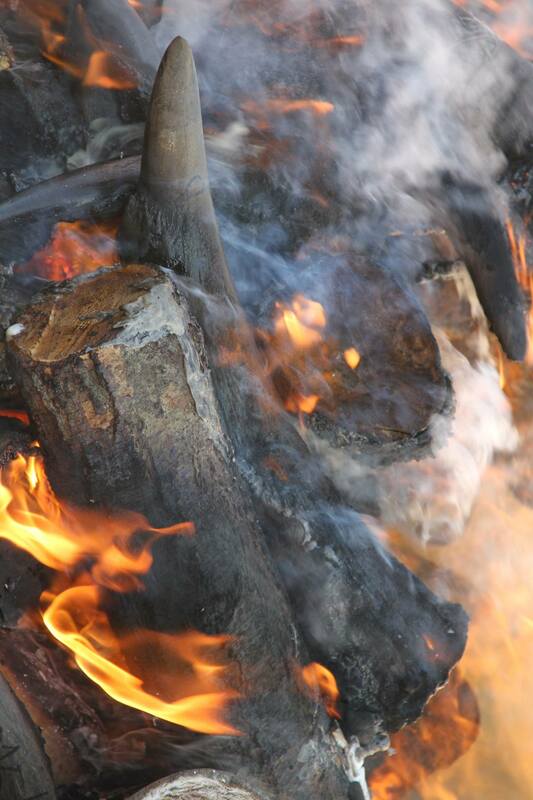 Mozambican authorities incinerated 618 elephant tusks and 86 rhino horns in Maputo on Monday, 6 July. The burn included 340 elephant tusks and 65 rhino horns seized on May 12 in the southern city of Matola, where police raided a house after a tip-off and arrested two Chinese citizens in connection with the haul. 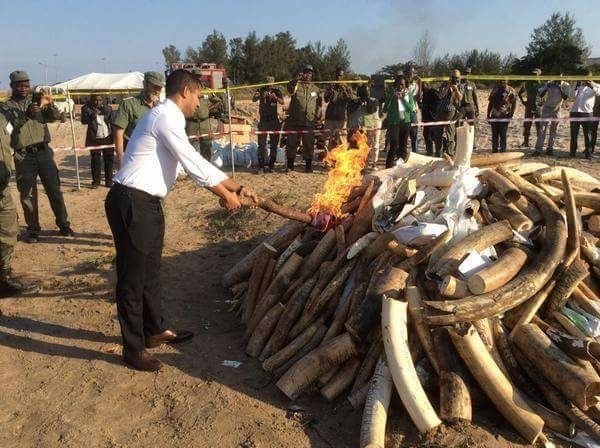 Minister of Land, Environment and Rural Development Celso Correia set the pile alight and said the purpose of the burn was to discourage poaching. In the northern part of the country, where the elephant population has been reduced by at least 50% since 2009, the government needs to focus on stamping out the corruption and official collusion that is helping the poachers.